Though Bell Helicopter’s booth at last month’s Heli-Expo at the Dallas Convention Center (Feb. 11-14) was nearly an acre in size, its integrated marketing strategy went well beyond its footprint to deliver results. The company’s program centered around a teaser campaign that drove more than 2,000 attendees to the reveal of its latest Bell 525 Relentless aircraft at the show and about 18,000 eyeballs (7,000 were non-employees) to the webcast version of the event. The reveal, named the “Most Spectacular Aviation Product Launch Ever” by Flying magazine, was such a success that by public demand, Bell provided an encore presentation the next day. 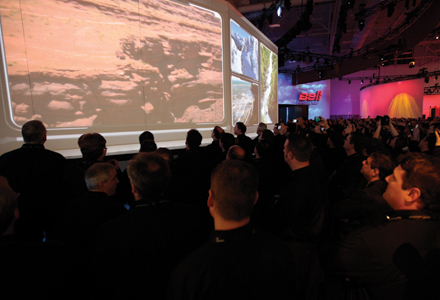 How did the company turn a one-time trade show reveal into an attendance-busting event? Fasten your seatbelts for a behind-the-scenes look. Bell Helicopter rolled out a steady stream of teaser messages to help it generate pre-show excitement for its presence at the expo. Months before the show, Bell piqued the interest of internal audiences with weekly “message clings.” The company placed messages that said “Altitude is about to get a Whole New Attitude” on bathroom mirrors and shop floors, alluding that something big was coming. The week before the show it posted a QR Code call to action driving employees to the site where the reveal would air live. 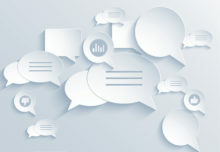 For external communications, Bell also sent out email blasts and direct mail driving customers to the website. “We produced a couple of teaser videos to create excitement, but we didn’t want to tell a whole lot about the product. We wanted to get folks to the point where they wanted to be there to see this reveal happen,” says Searle. “We also had some well-placed web ads and ads in our traditional industry publications.” Bell also placed teaser messages in the welcome area at the Dallas/Fort Worth International airport and at hotels, and pushed out information on Facebook and Twitter. At the convention center, it slapped an “R” icon related to the 524 Relentless on the main set of stairs and other areas of the venue. 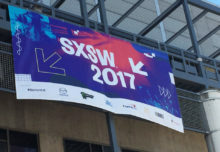 “We used a unique brand placement strategy designed to maximize visibility but also to drive traffic to the booth,” says Searle. Bell kept up the intrigue until the last second of the reveal. “We spent a lot of time teasing this product and we had done a good job making sure that information hadn’t leaked out to the marketplace, so we wanted to make sure that the perimeter was secure so that nobody could snap a picture and get it out there before the big unveil.” So while the booth was being built, Bell curtained off the space. Only badged workers and its Las Vegas-based handling agency Global Experience Specialists (GES) were allowed to enter the area. Taking advantage of the fact that this year’s show was in its hometown, Bell topped off the experience with a customer appreciation event at the 50-yard line of the Dallas Cowboys Stadium the night before the big reveal. “We had probably 2,000 of our closest friends come to the event and we used that event also as a teasing opportunity,” says Searle. They handed out cards with the reveal’s tagline and an “R” pin encouraging everyone to wear them to Bell’s booth at 11 o’clock the next morning. Bell kicked off the reveal with a traditional kabuki curtain, but when it dropped, the aircraft wasn’t anywhere to be seen. Instead, the live audience of about 2,000 was treated to a video mapping sequence that highlighted the aircraft’s features and then opened up to video testimonials from the people that worked on the aircraft. Examples of missions that the helicopter could be used for followed. The final sequence showed doors opening and through the projections, a Bell hangar appeared and the aircraft was revealed amid a light and smoke show (see it here: http://tinyurl.com/6pee9eg). Big trade shows like Heli-Expo give Bell’s sales team a chance to close deals, and this year was no different—the company sold several aircrafts on-site. “We really do use our trade show property as a way to provide an environment for our sales people to have those important conversations,” explains Searle, whose team tracks sales and the amount of people going through the booth. A post-event survey offers the marketing and sales teams even more in-depth data they can use for future event program strategies. Based on this year’s results, it looks like they have lift-off.